On January 31, 2004, I welcomed close friends and family into my home to join me in celebrating my 65th birthday. I was particularly honored to have two giants of rhythm, jazz drummer, Roy Haynes, who I have known for over forty years, and percussionist, Giovanni Hidalgo, who performed for the entire evening, in attendance. As usual, we had a great band to entertain us, which, on this occasion, consisted of Little Johnny Rivero, Jimmy Delgado, Ivan Renta, Robert and Mike Rodriguez, and Panagiotis Andreou. 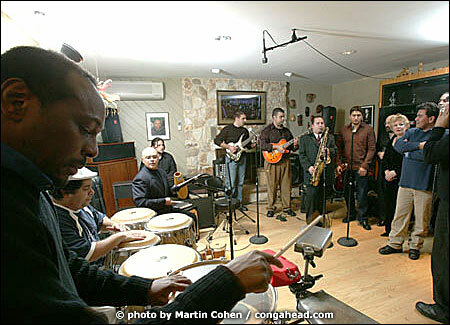 Joining them were Alfredo de la Fé, Luis Bonilla, Orlando Vega, Chino Bolaños, Ernesto Simpson, Arturo Romay, Samuel Torres, Edmar and Johanna Castañeda, Emeline Michel, Pablo Vergara, Roberto Rodriguez and Emeline Michel. I would especially like to thank Manny Mieles, who came all the way from Brooklyn, for engineering the recording of this event and for singing for us. Pablo Vergaro was so determined to come to the party that he commuted from and back to New York City by bus. When he arrived at the bus depot in Montvale, and found he couldn't get a taxi to my house, Pablo somehow managed to get the town police to give him a drive over! My wife, Vivianne, created an incredible feast that was enjoyed by all our guests. Many party-goers expressed amazement at her ability to plan and implement such an amazing event and then come down the stairs looking like a beauty queen. I am grateful for the enormous outpouring of love from everyone who shared the evening with me and my family, and I look forward to next year's party, which I know will be just as wonderful.